TheStadiumBusiness Summit 2014 (3-5 June, Wembley) sponsor, Green 4 Solutions specialise in sports customer relationship management and provide CRM, ticketing and loyalty solutions to venues around the world. Most recently, they have picked up the Queen’s Award for Enterprise for their efforts. Peter Olivier, Director at Green 4 Solutions, spoke to TheStadiumBusiness Summit 2014 on the latest innovations in their solution, in particular, its fan loyalty and rewards programme. What’s key to a successful loyalty strategy? Loyalty is simply an extension to CRM and in order to succeed it must all be focused around an overall data strategy where by the club uses loyalty to incentivise fans to share their personal data and behave in a certain way. It is this transactional background that can give greater insight and marketing capabilities to the club. How does the Green 4 Solutions fan loyalty and rewards programme work? Green 4 Solutions has developed an innovative fan loyalty and rewards programme, which allows customer interactions, transactions and behaviours to be tracked and rewarded with points. In other words, CRM with added motivation for fans to engage with the club. Points can then be redeemed for ‘money can’t buy’ rewards, either as a straight up redemption, as a hierarchical membership status that allow specific privileges, or redeemed through auctions and lotteries. Green 4 Solutions provides both the technology and expert assistance in building the program strategy and optionally resources to help manage operation to ensure that it is delivered on time and remains fresh and appealing to supporters. How can a fan collect points? Customers can collect points through spending with the club, tickets, merchandise, food and beverage and from the scanning of their ticket on entry to the stadium (to reward time of entry). They can also enter a promotion code, check-in at a location on their smart phone, or engage with club communications and social media. Essentially any interactions can be set to attribute points. This means that 3rd party partners such as pubs and restaurants can participate without the need for complex integration with their retail systems, simply by “checking in” from a specific location measured on your phone by longitude and latitude, we can encourage footfall in these establishments. How do fans redeem rewards? 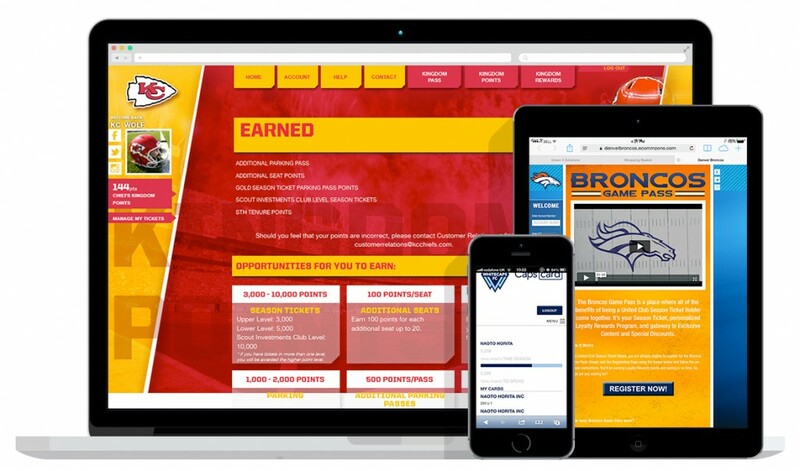 We have created an engaging web portal that gives the fan access to track their points and see a list of rewards. The portal can feature leaderboards of the most ‘loyal’ fans and exclusive content. Rewards can be redeemed in the form of a purchase on the site and there are also point’s auctions and lotteries for the chance to win a reward. Do you have any stats that show how loyalty works? Philadelphia Union FC increased their match day spend by $3 per head in season one. Kansas City Chiefs made $40,000 from one email campaign offering extra loyalty points for the purchase of a seasonal parking pass. Who uses this loyalty technology? We’ve seen real demand for this aspect of consumer CRM in North America, with a number of MLS and NFL clubs using the programme (Seattle Sounders, Vancouver Whitecaps, Philadelphia Union, Portland Timbers, Kansas City Chiefs, Denver Broncos and the University of Miami Hurricanes). We’re also seeing increased demand in the UK and other parts of the world now from Singapore Sports Hub to Huddersfield Town and Birmingham City. In Turkey and Qatar we are operating a Loyalty program across all clubs in their professional leagues. Meet the team at Green 4 Solutions and discover new ideas for your stadium business, only at TheStadiumBusiness Summit 2014! Email us.